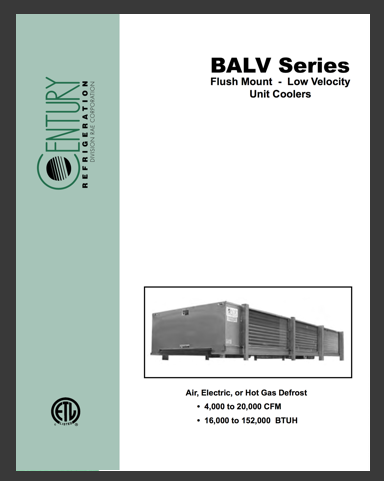 Century Refrigeration’s BALV Series low velocity unit coolers are designed for use in meat processing and cutting areas, florist boxed, holding and packaging rooms, and any application requiring low air velocity over product or high humidity and low TD. The BALV Series is a blow through design with two-way air throw and is designed for flush ceiling mounting, leaving no surfaces above the unit to be cleaned. 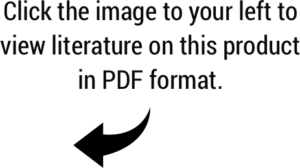 These units are constructed of a heavy gauge smooth finish aluminum cabinet with copper tube, aluminum plate fin coil, and permanently lubricated fan motors with inherent thermal protection The BALV Series units also have a hinged drain pan arrangement. The units are available in air defrost and electric defrost configurations.